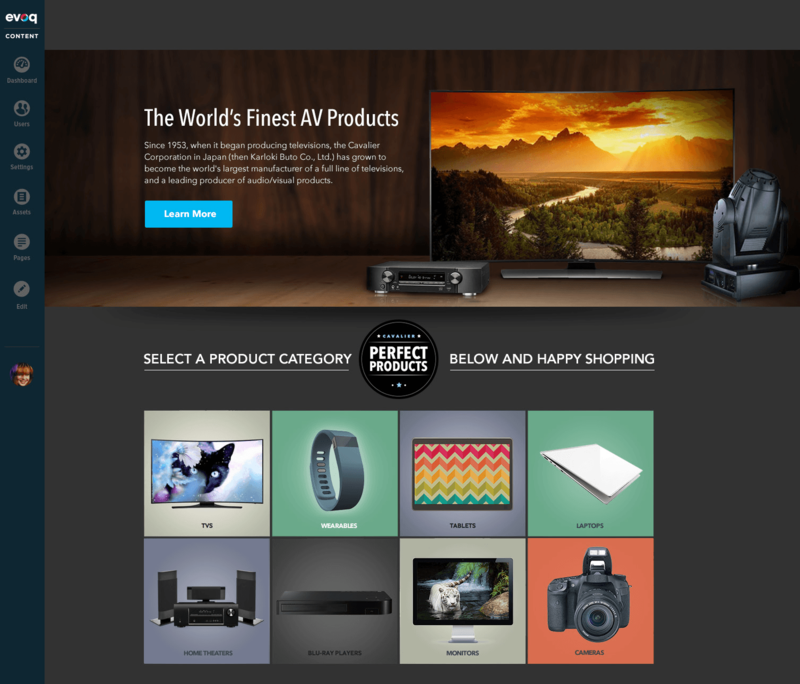 We’ve reimagined the user experience with Evoq Content 9.0. Our goal was simple: to streamline the content management experience for marketers and other business users who manage your web content. You may not be able to recognize version 9: we’ve followed a strict focus on design and usability, while empowering content editors and content managers with more powerful and easier-to-use tools. We’ve created context-aware, persona-driven profiles. In other words, our product delivers one set of capabilities tailored to the content editor, with a different set of capabilities for a content manager. This persona-driven approach ensures that we deliver the most relevant set of product features for particular sets of users. The Content Editor is provided with capabilities to add and update content on pages, including text, images and videos. The Content Manager has all of the capabilities of the Content Editor, along with privileges to add or delete entire pages. In previous versions of Evoq Content, a number of capabilities were restricted to Admin or Host users only. As a result, many organizations granted Admin rights to Content Editors. In Evoq 9, Content Editors receive an expanded set of capabilities that are tailored to their role (e.g. viewing the Recycle Bin), which was not available to them previously. 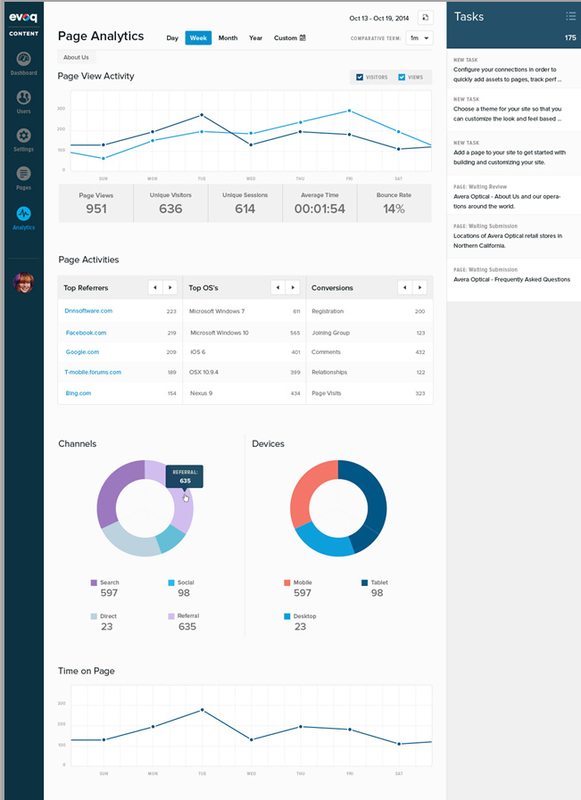 We now provide in-context page analytics for every single page of your website. Web content managers can now view information on page views, referrers, unique visitors and conversions, all without leaving your CMS. This feature is intended to compliment your existing web analytics system by giving you instant access to the information you need to measure the effectiveness of your content. In previous versions of Evoq Content, workflow was implemented at the module level: if a page contained five modules, workflow was administered for each of those modules. 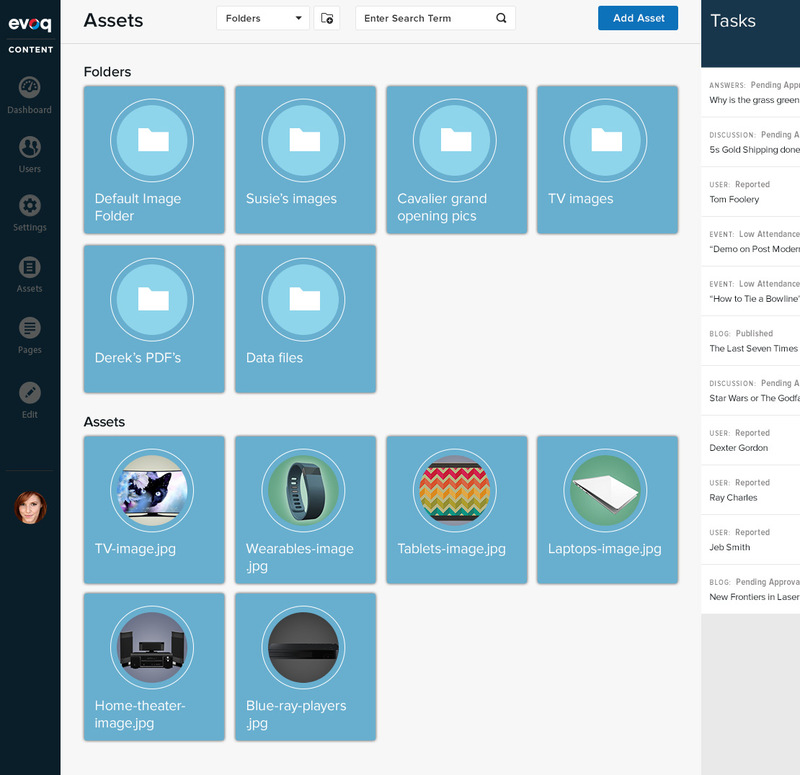 Evoq Content 8 simplifies workflow management by providing workflow at the page level. This makes life easier for both content editors and content approvers. 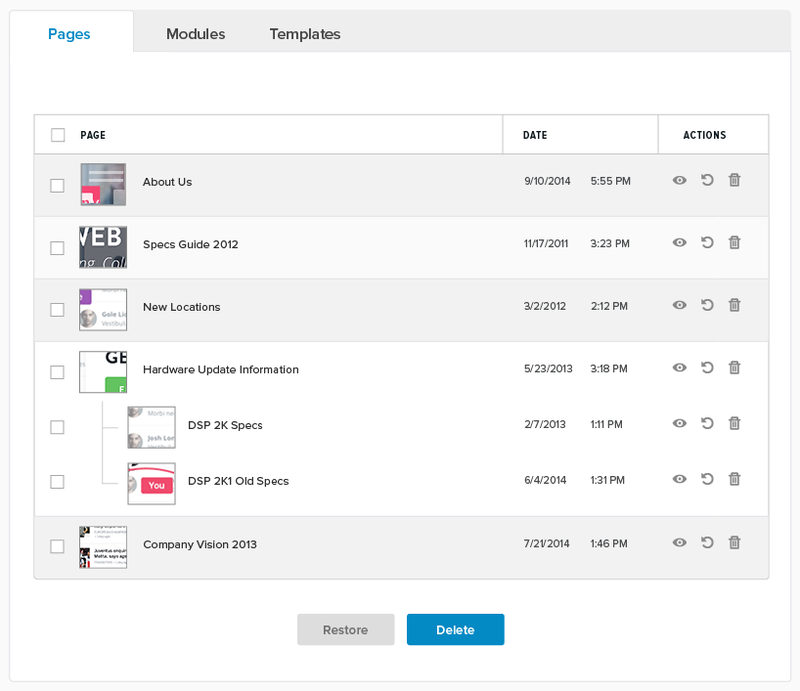 In Evoq 9, it’s never been easier for users to create and manage new pages. Users can select from a collection of built-in layouts, or assemble their own via a simple-to-use, drag-and-drop interface. 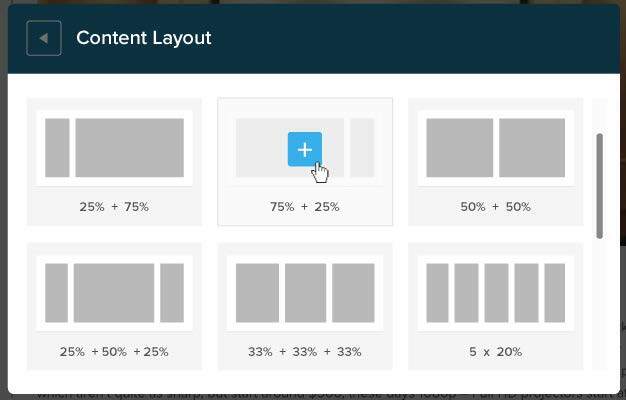 Users who create custom layouts can save the new layout as a Template, making it available for re-use on other pages. In previous versions of Evoq, images needed to be cropped and re-sized “outside” of the CMS, then uploaded. 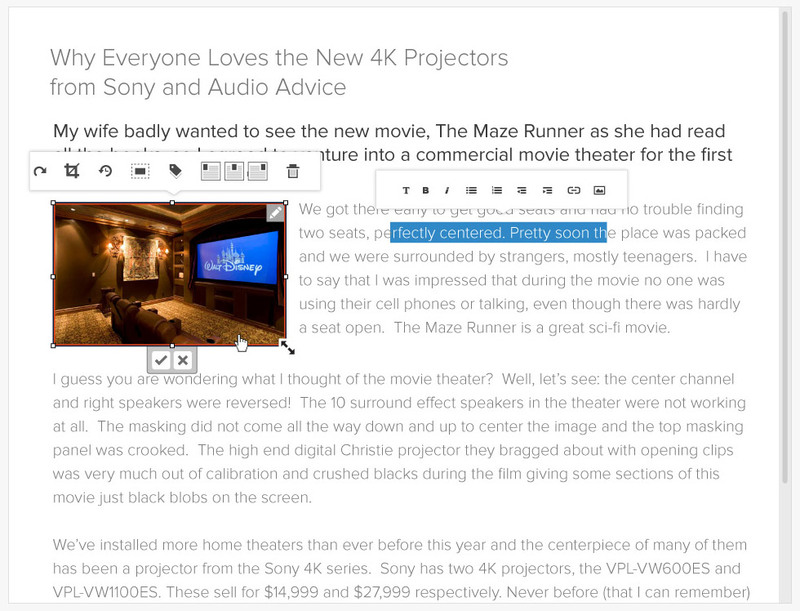 In Evoq 9, inline editing allows images to be cropped, resized or rotated directly where the image resides on the page. Once done, the modified image is ready for use on the site. Managing files (e.g. images, documents, videos, etc.) is an essential element of a CMS. With Evoq 9, we provide a re-designed file manager UI, which makes it much easier to find and manage files on your site. Our gallery view displays each file, alongside an identifying thumbnail image. Today’s web visitors expect personalized experiences. In other words, they need to see what they want, when they want it. 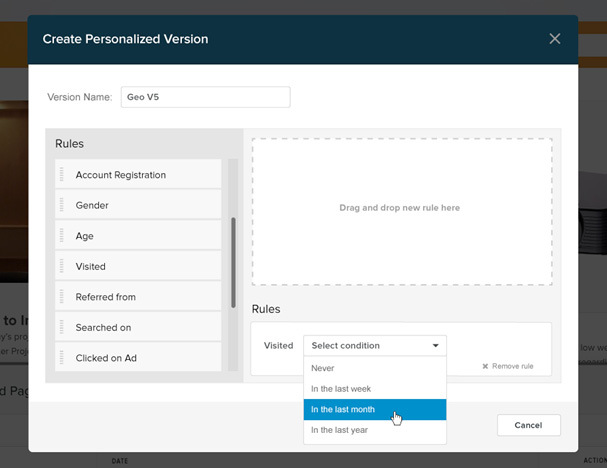 Evoq 9 enables you to build personalization rules that tailor site content based on the visitor’s profile. Rules are based on geography, account registration (i.e. registered vs. non-registered user), gender, age, recent visits, referral source, search terms and ad clicks. For example, on a page that highlights your Implementation Partners, content personalization can list your top five partners within 100 miles of the visitor (based on the explicit or inferred geographic location of the visitor). Setting up each connector is easy: enter the relevant credentials and the integration is complete in a few clicks. 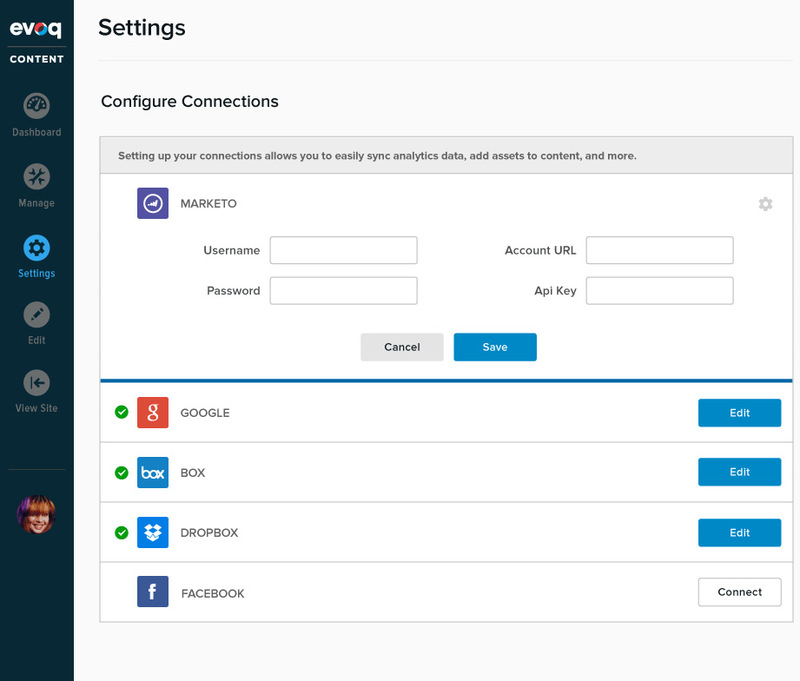 Our Box and Dropbox connectors make it easy for you to incorporate your cloud-hosted assets into your Evoq Content CMS, while our Marketo connector enables you to connect your website to your Marketo-based marketing automation system.